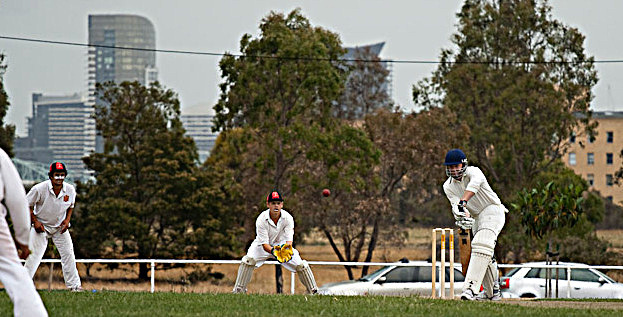 Under the guise of various forerunners, Parkville District Cricket Club (PDCC) has been involved in Melbourne cricket competitions for over 70 years. Under the various names that the seminal clubs competed under, the club has provided a friendly environment for playing cricket and received wide support form local residents. Parkville District, as it is now known, was formulated in 1993 as the result of a merger between Melbourne Central Cricket Club and North Old Boys Cricket Club. Both clubs had for many years been co-tenants in Brens Pavilion opposite the Melbourne Zoo entrance in Royal Park. Melbourne Central Cricket Club was originally known as Telegraph Cricket Club which began in 1960 out of what is now Telstra, and played their games at the Kings Domain opposite Melbourne Grammar in Domain Road. After moving to Royal Park, Melbourne Central then merged with the Martyrs Cricket Club extending the club to four teams. The club operated successfully for many years in the higher divisions of the competition with all four teams playing on turf wickets. Former co-tenants, North Old Boys Cricket Club were formed in the early 70's from players that had attended St Joseph's College in North Melbourne. In 1978 North Old Boys merged with North Melbourne City Cricket Club which was established in the 1920's as the Melbourne Branch in the ALP Cricket Association. North Old Boys Cricket Club operated successfully in the competition for many years, sometimes in the same division as Melbourne Central, making for some spirited matches between the co-tenants. The unified Parkville District now boasts five teams playing on the turf wickets that surround Brens Pavilion. The Clubrooms were completely rebuilt in 1998 giving Parkville District facilities that rival those of any other club in the competition. The club's teams now compete in the Mercantile Cricket Association, based around inner Melbourne's Fawkner and Royal Parks. With enormous recruiting potential in the surrounding suburbs, strong links with the Melbourne University Colleges and the West Brunswick and University High School Football Clubs, the club is well placed to continue the success of its previous years.